Looks like the technology business in the cruise industry is hotting up with Carnival announcing a new Hybrid Wireless Network at Sea. This comes after Quantum of the Seas operated by Royal Caribbean boasts super fast speeds 25/7. An enhanced high-speed service to eventually be rolled out to all 101 of Carnival owned ships on all nine of its brands. This technology innovation is expected to revolutionize how millions of its passengers stay in touch during their cruise and generate even greater interest in cruise vacations, especially among the tech-savvy millennial generation. “This is a major technology breakthrough designed to enhance the cruise experience for our passengers,” said Ramon Millan, senior vice president and global chief information officer for Carnival Corporation. 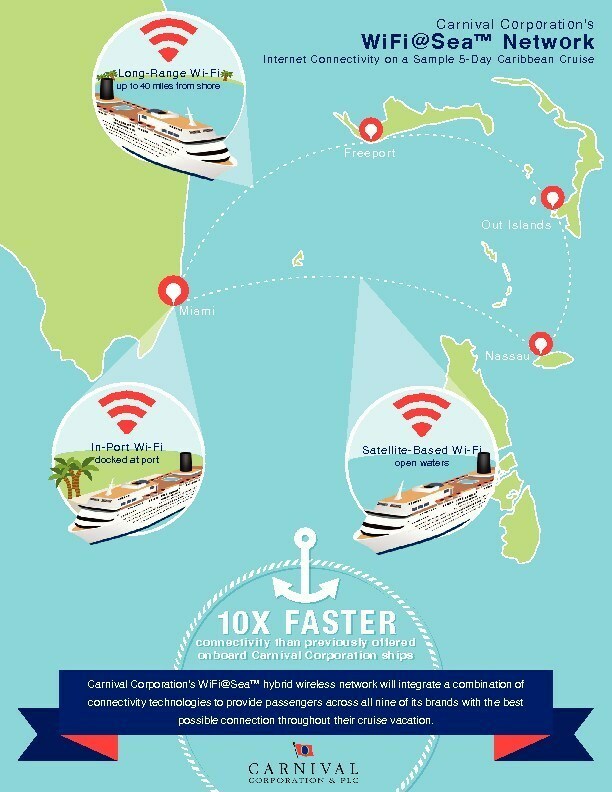 Carnival Corporation’s backbone connectivity network, known as [email protected]™, will integrate a unique combination of strategically located land-based antennas installed along cruise routes, Wi-Fi from a port connection and advanced satellites, forming an innovative network that is a first in the cruise industry on this scale. The “smart hybrid” network is designed to provide passengers and crew with faster and more stable internet access throughout their voyage – a feature becoming increasingly important to travelers of all ages looking to stay connected and share their experiences through social media. “Our guests are looking for different experiences when they cruise – some are interested in disconnecting and others are interested in staying in touch with their world back home. For those who want to stay connected while on vacation, our new network will help them do so, whether that means checking email or posting pictures to their social media sites. Ramon Millan, senior vice president and global chief information officer for Carnival Corporation. Once completed, the integrated network will seamlessly switch among its various technology solutions to give passengers the highest available bandwidth capacity and strength of signal. The network will be capable of providing Internet connectivity speeds that can be roughly 10 times faster than those previously offered on Carnival Corporation’s ships – ultimately expected to provide passengers with the best possible connectivity in the cruise industry. Following the initial launch in North America in fourth quarter of this year for ships sailing in the Caribbean – the world’s most popular region for cruising – Carnival Corporation is scheduled to rollout the technology globally. Under the current plan, the expansion will continue with Alaska in summer of 2015 and will extend to the Mediterranean, Baltic, Western European and Asian regions in 2015 and 2016. The technology will eventually be available on all nine of the company’s leading global brands – AIDA Cruises, Carnival Cruise Lines, Costa Cruises, Cunard, Holland America Line, P&O Cruises UK, P&O Cruises Australia, Princess Cruises and Seabourn. The newly equipped ships will connect to the new wireless network via multiple technologies – port Wi-Fi, long-range Wi-Fi and a fleet of advanced satellite systems over multiple frequency bands. The network will seamlessly switch back and forth between connection types based on which option will provide the best user experience at that time. Much like a cell phone changing from one data connection to another while moving across a coverage area, the toggle between networks will be transparent for travelers and managed behind the scenes by a high-tech system. Carnival Corporation has been piloting this technology for over a year, and due to positive guest feedback and the overall success of the program, the company is moving on to the next phase of implementation. Pricing will vary by brand upon service rollout. 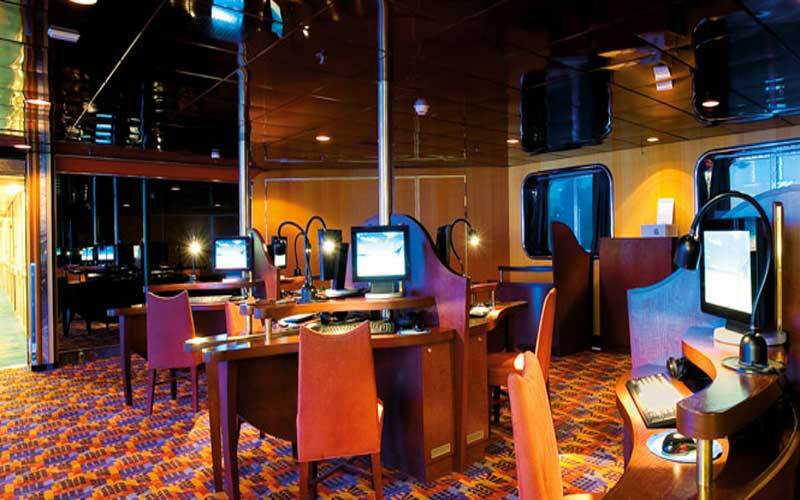 In looking to the future, this first-of-its kind, hybrid approach to Internet connectivity at sea will allow Carnival Corporation to add new technologies to the network as they become available. Similarly, the scalable model will allow the company to extend the network as it adds new ports of calls and routes to its upcoming ship itineraries.